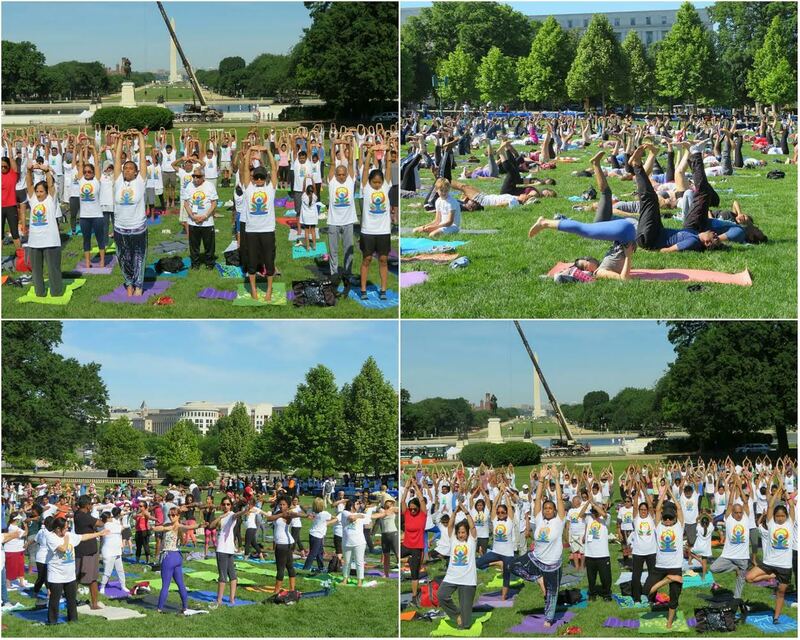 WASHINGTON, DC – The fourth International Day of Yoga drew a large and diverse crowd to the nation’s capital on a sunny and warm Saturday morning in late Spring. It was a stunning sight to behold some 2,000 yoga aficionados practicing an ancient Indian discipline against the awe-inspiring backdrop of the US Capitol. 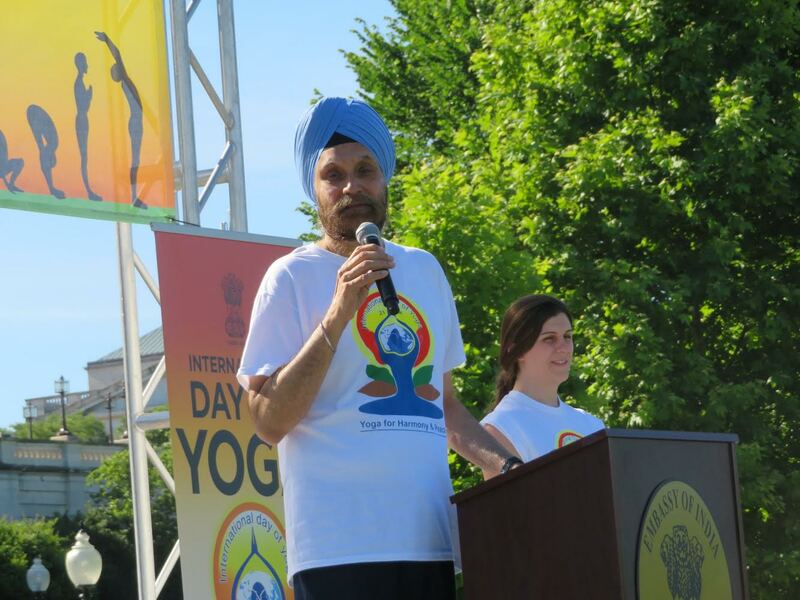 Describing yoga as “a journey inwards”, Ambassador Navtej Sarna told the attentive crowd, “It was always a popular discipline, but I think a qualitative and quantitative change has come since 2014 when under the guidance and inspiration of Prime Minister Narendra Modi, the United Nations recognized June 21 as the International Day of Yoga. It was recognized through a resolution which had a record co-sponsorship of 177 countries”, he said to much applause. “This is an endorsement like no other that the world has accepted what the prime minister called ‘one of the ancient gifts of Indian sages to humanity’,” the envoy added. Thanking the participants for attending the event “in such great numbers very early on a Saturday morning, on a very sunny morning”, Sarna noted, “It shows the huge enthusiasm for yoga. “We are sure in the years to come, this effort will grow from strength-to-strength and one day we will have a yoga day which stretches from the Capitol to the (Washington) Monument”, he predicted. 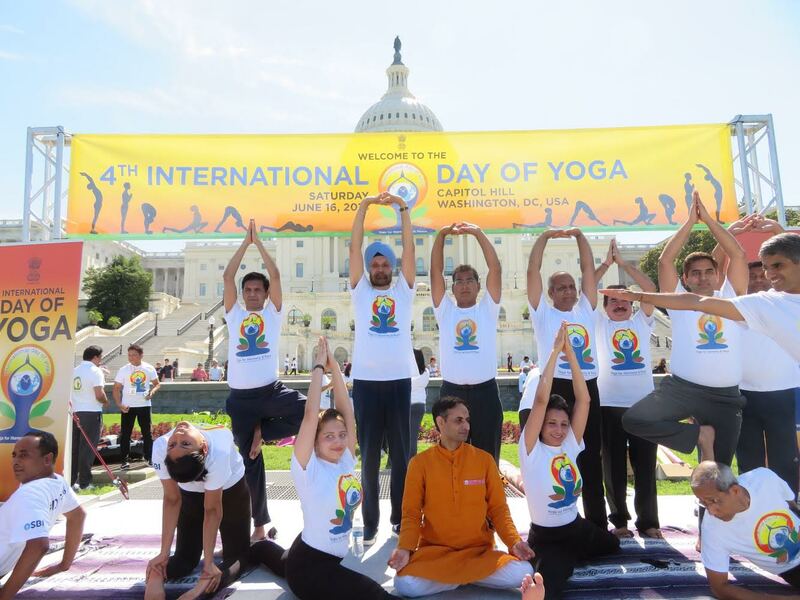 Ambassador Sarna led the guided yoga practice on the expansive West Lawn of the US Capitol joined by: the envoys of Mauritius, Sooroojdev Phokeer, and Myanmar, Aung Lynn; Charge d’affaires of Sri Lanka, Priyanga Wickramasinghe; Virginia Delegate Danica Roem (Democrat – District 13); US-India Business Council president Nisha Biswal; and a record number of yoga enthusiasts for the eagerly-awaited annual celebration in DC. The event was organized by the Embassy of India here, in cooperation with ‘Friends of Yoga’, a group of local organizations including India International School, Happiness Yoga, Durga Temple, Sri Siva Vishnu Temple and Chinmaya Mission. Aparna Ramaswamy, a representative of the Maryland-based Sri Siva Vishnu Temple served as the emcee of the event. Addressing the crowd, Roem proclaimed at the outset: “I’m proud to be a committed yogini”, practicing since 2013. “Yoga is the antithesis of the modern competition that we have in the world where we try to one up each other”, she said. “Yoga is about endurance in the moment and the only competition is with yourself. It is that moment of harmony, peace, ahimsa, non-violence”. Roem made political history last year by becoming the first openly transgender person elected to a US statehouse, and in the process she ousted a 13-term incumbent from office. A former journalist, she now represents the residents of Manassas Park and the Prince William County portions of Manassas, Gainesville and Haymarket. “Yoga was absolutely fundamental to helping me find confidence in myself to be the woman who I am today and it was absolutely instrumental in my transition”, she said at the Capitol Hill event. “Yoga does not discriminate or judge”, she noted. “It is simply welcome, I’m glad you are here. Yoga is unity and we are united here today on our National Mall”. Speaking about the unifying quality of the discipline in a special message on the fourth annual observance, Prime Minister Modi said, “Yoga is a journey from ‘me’ to ‘we’.” As we begin to understand ourselves much better, it makes us understand others better and enables us to form a constructive bond with the society at large, he noted. “Yoga makes us better individuals in thought, action, knowledge and devotion”, he said. “People who are at peace with themselves are at peace with others, too. So, people build harmonious nations”. The prime minister made it clear that yoga is not just a set of exercises, rather “a passport to health assurance, a key to fitness and wellness”. From finding ways to control communicable diseases he noted the focus is now shifting to non-communicable lifestyle diseases such as stress, depression, diabetes, and hypertension. “Yoga is the cure”, he underscored. Modi has made yoga an integral part of India’s global outreach and he was pleased that the popularity of yoga is on the rise globally. According to a 2016 survey, 36.7 million people practice yoga in America. “With more people embracing yoga, the demand for yoga teachers is also rising”, the Indian prime minister said. “Our next challenge is to produce institutionally-trained yoga teachers who can ignite this flame further especially among the youth”. In a Yoga Day message, Indian External Affairs Minister Sushma Swaraj noted that the discipline keeps individuals stress-free as it calms the mind. “We must adopt yoga in our daily life to have mental peace, and also for a peaceful world”, she said. Among the US elected officials who sent messages of support for the celebration of Yoga Day were: Virginia Governor Ralph Northam; Democratic Senator Tim Kaine of Virginia; Democratic Congressmen Don Beyer and Gerry Connolly of Virginia; and Democratic Congressman Raja Krishnamoorthi of Illinois. Noting that “Yoga is an ancient tradition which exemplifies the harmony between the one and nature”, Governor Northam said it was heart-warming to see so many Virginians coming together to celebrate an event that showcases a rich culture and diversity. Conveying “best wishes for the successful celebration of the fourth annual International Day of Yoga”, he thanked the Embassy of India and Friends of Yoga for all their efforts “to make this great event possible”. Senator Kaine stated, “While the idea of International Yoga Day is new, this art is built upon ancient Indian principles borne of a desire to maintain inner well-being. Yoga symbolizes unity of mind, body and spirit”. Congressman Beyer noted, “International Yoga Day is a time to share, deepen and celebrate the dimensions of Yoga”. Congressman Connolly believed the celebration is “a testament to the transformative nature of yoga and the Indian-American community’s indelible mark on the cultural fabric of the United States”.